My friend Larissa recently recommended that I check out Tasty Bite's products. I was a little hesitant when I checked out the website -- Indian food from pouches? I would normally pass over such a suggestion but I know that Larissa is a girl who loves food. We've eaten together in New York, Istanbul, and Athens and whenever the place is her choice it's always a delicious meal. 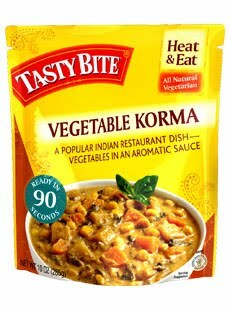 Tonight I tried out the Vegetable Korma and it was super simple to prepare -- just tear the bag, stick it in the microwave for 90 seconds, and press start. I bought an Imusa rice cooker yesterday from Bed, Bath, and Beyond and decided to use it to complement the Vegetable Korma. The meal was delicious! The Vegetable Korma was unbelievably great. Again, I was initially hesitant about Indian food from a pouch but wow, Tasty Bite definitely delivered on the flavor. Pair your Tasty Bite with some rice and you'll have a full meal that is very simple to prepare. I'll definitely be stocking up on these when school starts up again. Perhaps the best part is that the products are clearly marked "Gluten Free" above each individual bag's Nutrition Facts. Make sure that the product you're interested in is marked gluten free; many of the products are also vegan and kosher.